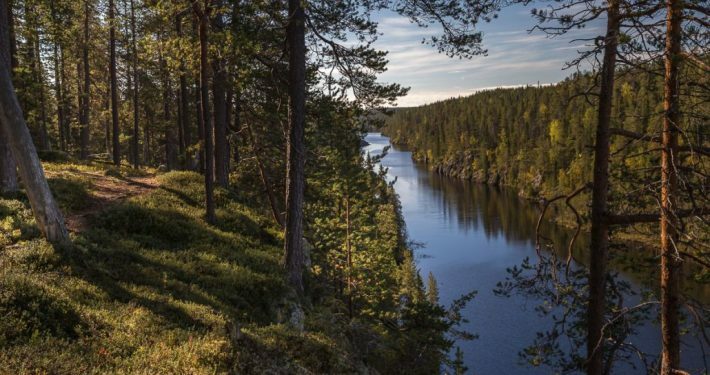 This is why Hossa national park takes your breath away. Hossa is a legend in Finland. It is an important natural forest area and is widely known for its bright waters. In Hossa you will find suitable trails for mountain biking as well as hiking – over 90 kilometres altogether. You could easily hike for a week. Routes are marked clearly, so you don’t need to worry about getting lost. You can get maps for the area from the nature centre, and local guides will advise you on an interesting route suitable for your needs. The area has been inhabited since the Stone Age. Ancient man’s handicraft is displayed, for example, at Värikallio, where some of Finland’s most important rock paintings can be found. 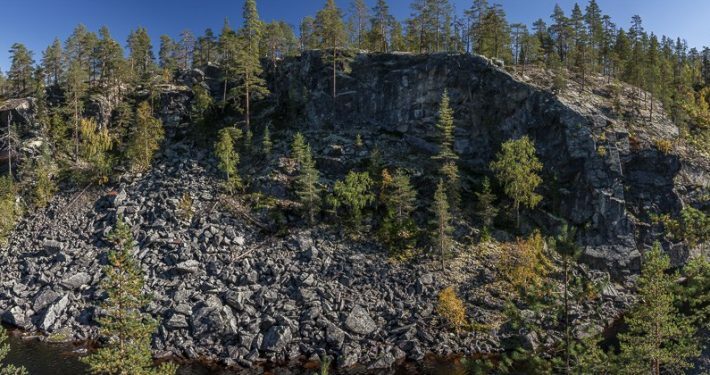 More than 60 rock paintings have been recognized on Värikallio. In turn Julma-Ölkky’s canyon lake astonishes by its shyness and wilderness. The easiest way to get to Hossa National Park is by car. On school days, however, Hossa can also be reached by bus from Kuusamo. Find your bus here. If flying to the region, the nearest airports are: Kuusamo, Kajaani or Oulu, from where you can hire a car and drive into the midst of Hossa’s unforgettable landscapes. The best way to get in touch with the nature is a cottage from which it is easy to get in nature and where it is cozy to rest after day in the wilderness. You can rent cabins from Camping Hossan Lumo, where the adventure starts at the wonderful sandy beaches. Hossa’s nature has something to discover in any season of year. Take a SUP-board and paddle across the clear waters and dip in the lake from the spectacular sandy beaches or explore the numerous paths of Hossa’s forests. 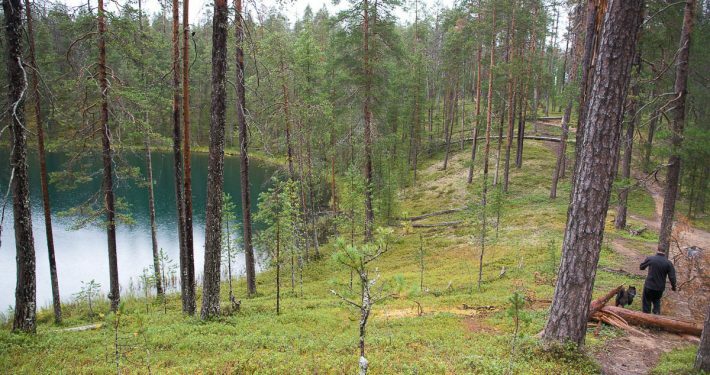 Hossa Nature Trail is a 3 km long circle trail that leaves the Visitor Center and circles the beautiful Huosiuslampi. There are also fire places along the trail. The bend of the Muikkupuro or “Muikkupuron mutka” leads to one of Finland’s most famous lean-to shelter, Muikkupuro. The lean-to shelter is located in a really beautiful location. The distance travels for 1.5 kilometers. Accessible path. Ölökyn Ähkäsy is a 10 kilometer long, demanding circle trail in the unbelievable scenery of Julman Ölkky’s Canyon Lake. In Hossa there are also a number of MTB-trails. You can rent MTB for example from the Hossa Visitor Center or Camping Hossan Lumo. Harjujen Huikonen is a 12.5 km long circle route, which requires a bit of a previous mountain biking experience. Along the way there are for example stunning ridge landscapes. Sininen saavutus runs almost everywhere in the Hossa National Park and it is 50 kilometers in length. The circle route is demanding, so it requires a more experienced mountain biker.